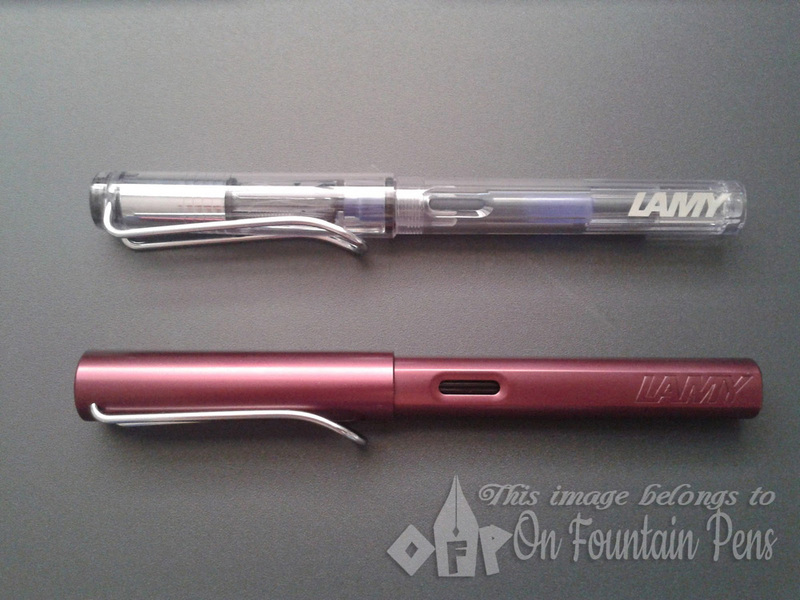 This review will be about my first two and only Lamy fountain pens. One was bought at Fook Hing Trading Co. on impulse because of the beautiful colour (Lamy AL-star black purple) and the other was bought online just so that I can have a Lamy Safari which is a demonstrator pen, at the same time (Lamy Vista Demonstrator fountain pen). The reason I am doing a comparison review for these pens is because they seem to be very similar in grade and quality, and both have very similar designs to the Lamy Safari range of pens. I don’t have a Safari myself (yet) but I will be thinking of getting one soon. Or perhaps a Lamy Joy instead. Comparing the shapes and designs, they don’t differ by a lot — the same kind of metal clip on both pens catches my attention first. They also have the same window at the side of the pen body to show you how much ink is left. Both pens feel almost the same in size, but the Vista is in fact slightly smaller that the AL-star. The metal clip of the Vista protrudes slightly more at the top of the cap. I believe the purpose of such a design of the clip is to make it convenient for the user to clip the pen to the side of a book or pocket. I don’t usually do this but I can imagine that it would really be very convenient to do so if the need arises. Now they look like aliens. Not very nice. Out of curiosity, I exchanged the caps of both pens, and alas, they don’t fit each other! The AL-star cap fits over the Vista with a barely audible click but you can expect this combination to fall apart with some rough movements of the pen in the bag or pocket. As for the Vista cap on the Al-star: no click, nothing. They just won’t fit. Bad mating suggestion of both pens. They aren’t very friendly to each other. I am guessing that the “AL” in “AL-star” refers to aluminium, which is indeed the material of the pen body of the abovementioned. This isn’t rocket science. Don’t you love the anodised purple-black coating on the pen? I was pretty lucky to get the last piece available at Fook Hing with this colour! The aluminium material makes the pen pretty lightweight and I don’t feel much of a weight difference between the aluminium and the plastic. When posted, the lengths are the same and the plastic Vista feels slightly lighter at the top, so for people who prefer top-heavy pens, the AL-star is for you. But if you’re concerned about the material, I saw a review online that the anodised layer of colour for the AL-star gets scratched off over time, especially if you post the pen a lot. To be honest, I don’t think it is a very great difference actually. I am not so sensitive to weights of pens while writing, and I don’t normally post my pens. Enough about the appearance: now for the writing. The nibs of both pens are equally made of polished steel, and I bought a Fine for the AL-star and a Medium for the Vista. Visually they don’t seem to show much of a difference. In fact, writing-wise, there didn’t seem to be much of a difference either. 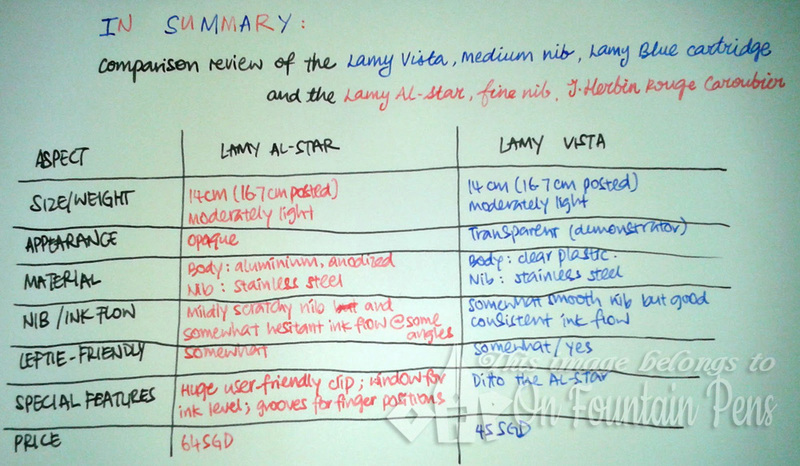 If you refer to this page regarding my Pilot Medium Varsity pens, you can see a writing sample which contains Lamy Vista with Lamy Blue ink, and Lamy AL-star with Pelikan 4001 violet ink. There was barely any perceivable difference between the line widths. Not believing that I got a Fine line for a Medium nib for my Lamy Vista or a Medium line for a Fine nib for the AL-star, I changed the ink of the AL-star to my J. Herbin Rouge Caroubier and tried again. This time, it even seemed that the AL-star produces a slightly thicket line than the Vista. Pffffft! Just my luck regarding the line width. I was told that I could change the nibs of the Lamys easily, and I found out also that there exists left-handed nibs for Lamy pens! Perhaps I should consider buying one leftie nib one day and replace one of these. Speaking about handedness, it’s not always easy to achieve smooth writing with a fountain pen. There were reviews online saying that the Safari range is incredibly smooth, and the AL-star was a great buy because of the smoothness of the writing. As I got my AL-star first, I tried it out and it was mildly scratchy for me. The ink flow wasn’t always consistent and I found out that depending on the angle I hold the pen, variations in line widths are produced. When I posted the cap, the weight on the top forces my writing angle down a little, and this time it produces more consistent ink flow and line widths. However the scratchiness felt as if there was a piece of fibre stuck in between the tines of the nib, though there was none to be seen upon observation. Then came the Lamy Vista. Expecting it to perform exactly like the AL-star, I didn’t have high expectations of it, but the moment I plugged in the cartridge and wrote, it was so smooth that I was surprised! Firstly the ink flow was definitely consistent, and even though there was some variation in the line width like the AL-star, my writing was generally consistent as well. Well then, maybe there was some discrepancies in manufacturing the nibs of the two pens. Generally I am very satisfied with both my Lamys (Lamies?) and I can imagine using them for a long time. Not to mention that the Lamy converter is a twist-action plunger which is really easy to use.